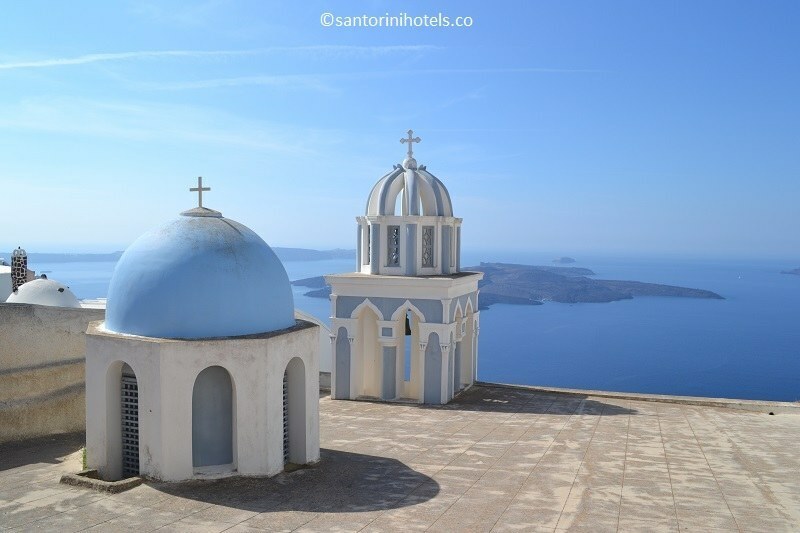 Firostefani Santorini by Santorini Hotels & Suites. Explore Firostefani! Firostefani Santorini. The underestimated beauty of Santorini. Firostefani lies between Fira and Imerovigli. Due to its location, in a walking distance from north part of Fira, it’s convenient for those visitors who want to be near the capital of Santorini but in much more quiet area. Firostefani is a less known settlement of Santorini, but it offers the same main attraction, a breathtaking view of the Caldera and the sunset. Firostefani name is inspired by the elevation difference of the village in comparison to Fira (Firostefani is built higher than Fira). Hotels in Firostefani are also luxurious with wonderful traditional design. Cosy cafes offer a unique view of Caldera and the Aegean Sea, restaurants and taverns serve dishes inspired by local cuisine and ingredients. As we mentioned before, Firostefani is quieter than the neighbouring Fira, even during the peak of summer season. Therefore the climate is relaxing and the serenity is more obvious. A petite one among Santorini villages.